At the end of each quarter, investors await the results of earnings reports that U.S. corporations must file with the U.S Securities and Exchange Commission. Typically, those investors focus on profitability – the bottom line. Increasingly, they also need to mind something else: the top line. To foster financial literacy, the Talking Money feature covers common terms and concepts used in personal finance and investing. 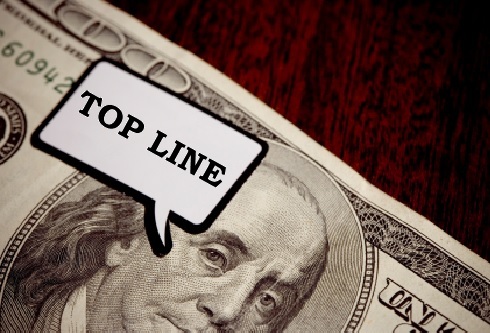 In this edition, Chris Evers looks at the corporate top line. For more Talking Money terms, please click here. The top line is a phrase for revenue, generally in the form of sales, which appears at the top of a company’s income statement. That number is then reduced by the company’s expenses, and the remainder is the company’s earnings – what many refer to as the bottom line. The bottom line is a sacred number to investors as it quantifies the profitability of a business and therefore guides how a share of that business should be valued. However, in order to get a better understanding of the path that lies ahead, investors must look beyond the bottom line. During the economic downturn, corporations experienced a sharp reduction in sales. In response, they cut costs to lower expenses and enhance margins. Cost cutting has been achieved by reducing employment, lowering spending and improving efficiencies. As a result, corporate earnings have been improving, adding to shareholder value and driving impressive gains of domestic equity markets. Eventually, cost cutting will reach its limit. Click here to view a Money Talk Video of Bob Landaas discussing the importance of watching the top line. Only an increase in sales will be able to raise profitability once cost cutting has run its course. “The top line can be improved through a few ways: mergers and acquisitions, taking market share from competitors and, finally, growth through new demand,” said Dave Sandstrom, vice president of Landaas & Company. Growth through new demand results in market expansions, which U.S. companies can try to achieve by developing exports and innovating products. “The U.S. market is very mature, and it is getting harder to get money out of people with marginal product improvements,” Dave said. Don’t be overexposed to either fixed-income or equity. Putting all your money on one horse may be tempting, but more times than not, it will leave you empty-handed. Though the outlook on the equity market is positive, it is always important to give yourself some downside protection through a balanced portfolio of both stocks and bonds, which helps weather the inevitable volatility of the market. Put some trust in actively managed funds. As companies compete for sales growth, a group of winners and losers will emerge. To assure that you hold more winners than losers, find actively managed funds. Top-level mutual fund managers will prove their worth as their expertise and discretion can give them an advantage over passive funds. There’s no such thing as fashionably late. Nobody can time the market. Those who try, usually end up being worse off. Instead, sooner is better than later. Make sure you are exposed to the upside of the stock market because when sales begin to grow rapidly, it may be too late to jump on board. Companies strive for higher profitability, and if they can no longer squeeze profits from margins, they will need to turn their focus to raising the top line. To what degree companies succeed warrants watching. Chris Evers is an investment intern at Landaas & Company. He is a senior at Marquette University majoring in economics and finance.